The human race likes to see itself as separate from the rest of earth's many species, but as researchers develop more thoughtful experiments, those barriers have a tendency to fall away. Scientists have long believed, for example, that tool use in humans must be learned from others. 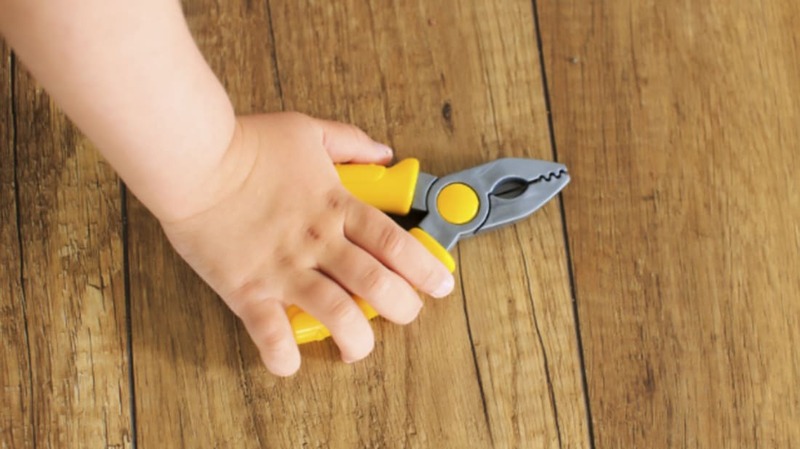 But according to a new study published this week in the journal Proceedings of the Royal Society B, human toddlers and apes are in fact equally adept at figuring out how to use tools. Tool use is a big deal in behavioral science because it represents a pretty sophisticated way of thinking. Many previous experiments on animal tool use have used a very people-centric approach, grading other animals on their ability to perform human tasks. These experiments are biased from the start, write the authors of the new study, because when those animals have failed to perform human-oriented skills they would never need in the wild, the researchers have concluded that they’re simply not as smart as we are. The new study set out to correct those mistakes. Rather than measuring an ape’s ability to act like a person, they measured human kids’ ability to act like apes—which makes a lot more sense, evolutionarily speaking. The researchers were curious to find out if toddlers were capable of discovering tool use on their own. They also wanted to know if tasks that are harder for apes are harder for people. To find out, they created the Great Ape Tool Test Battery (GATTeB), a list of 12 common tool-use behaviors in wild chimpanzees and orangutans. Items included using a twig to dig seeds out of fruit, cracking a nut with a rock, or picking the marrow out of bones with a small stick. They brought in 50 kids 2–3.5 years old and put them to work. Earlier studies have suggested that an adult ape and a 2-year-old child have equivalent intelligence, but because some of the tests were tough, the researchers decided to include slightly older kids. Before the tests began, the kids got a warm-up play session where they learned that they were allowed to break, manipulate, and destroy the objects in front of them—a crucial element, since several of the tasks required breaking or poking holes in things. And they did. Collectively, the kids solved 11 of the 12 tasks. Eighty percent of the time, they picked up the right tools for the job, even when they couldn’t figure out what to do with them. Without hints, lessons, or anyone to imitate, the kids invented tool use all on their own. This suggests, the authors write, that “humans are neither born with special physical cognition skills, nor that these skills have degraded due to our species’ long reliance of social learning in the tool-use domain." So parents, give your kids some random objects to interact with and see what they come up with.